Hello All - See attached drawing. 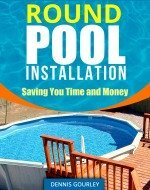 I'm installing a 22' round above ground pool. Because the ground slopes, my pool had to be sunk into the ground a bit. While digging I hit clay, so I went down another 10" thinking I'd need to create a strong base for the pool to sit on. I'm thinking about using 6" of stone dust that I would compact with a plate tamper. The pool frame and uprights would sit on the stone dust. The liner would sit on top of 4x8 Styrofoam panels from Home Depot. I'm not sure this is the best way to do it. Any input would be appreciated. I've also considered cutting a trench around the perimeter for weeping tile that would be piped into a sump pit. Hi Kellie. You plan sounds just fine. The stone dust would make an excellent base for the pool. If you use the foam sheets be sure to use plenty of duct tape on all the joints. I recommend using preformed pool cove when using the foam sheets. The foam comes in two types. I would use the type with the sticky back and place it on top of the foam against the sidewall. If you backfill the area with dirt or stone dust you should not have to worry about drainage. If the area is not backfilled you will need to do something so that the pool never sits in water. I would just backfill around it. I've decided to use the sand base on the inside of the poll wall since I want a Bowl curvature at the bottom. Should the difference in sand height from the wall(3") to the center(2") be 1"? What's the best way to do this? Considering I've put down a stonedust base, would it be a good precaution to install concrete blocks under the wall plates? Do the uprights go in before or after the pool is filled? Hi. I use about a 6" cove and it is basically a wedge shape that slopes down into a 2" base. Using blocks is always a good idea. The entire pool should be completed long before the pool is full. So Pool went in beautifully. Now It's time to back-fill. I'm worried about frost heave, considering one side will be buried much more than the other. I was thinking, If I mix packing nuts in with the back-fill(topsoil) at a ratio of 1 to 2, at an approximate thickness from the pool of 1.5 ft, it would work. Is this overkill? Should I tar the walls on a side note? Hi Kellie, taring the outside is not a bad idea. As far as the back fill, that does not sound like a bad idea, it just might work.